Positive intergroup contact has been suggested to be one of the most succesful tools to improve relationships between different group members. Contemporary research now shows that intergroup contact is not only a group-based process which reduces prejudice and discrimination, but it is a more sophisticated experience which also touches upon individuals’ belief systems, cognition, and personality. Recent research trends in intergroup contact literature have focused on a) how contact is experienced among minority group members, b) positive-negative contact asymmetry, c) contact in conflictual intergroup settings, d) indirect forms of intergroup contact such as extended and imagined contact, e) and contact effects on processes beyond outgroup attitudes and behaviors, such as collective action and acculturation. 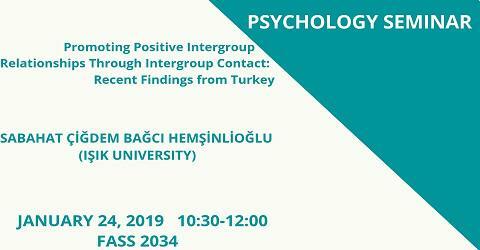 In this talk, through various correlational and experimental studies in Turkey, I attempt to show the function of intergroup contact on various intergroup and individual level outcomes among various intergroup contexts. Findings show that contact is an effective remedy againts negative intergroup processes under certain conditions.